8th Floor 939 Progress Ave. Address provided upon confirmation of registration. Friends of Jesus Christ Canada - "Untold Stories"
Exploring the idea of faith during and after the Holocaust with Rabbi YY Jacobson. Please note, date and time change from the print calendar. The artist will be present during this time. Address provided upon registration confirmation. 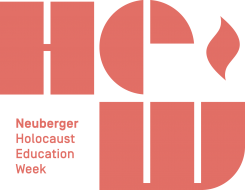 Holocaust Education Week Event at Tyndale University.